Externally the letters LGBTQ signify a community. We stand together against the outside force of homophobia, but internally we are still divided by prejudice. This is because we are too diverse a group to have a common identify. But we should be able to have common respect. 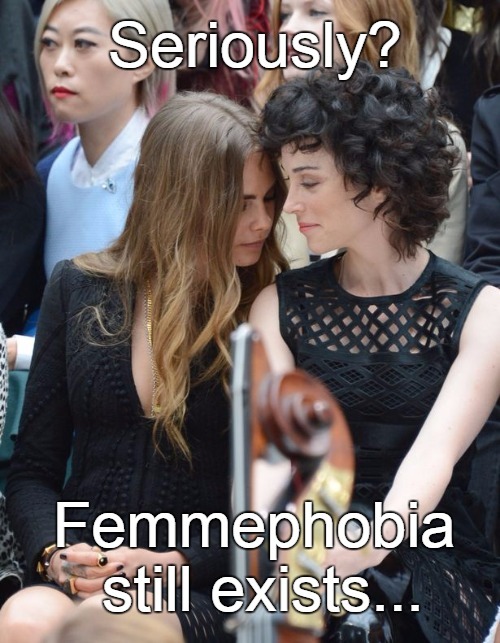 On social media this week, the issue of femmephobia has reared its head again. For me, this is really sad; three years on from when I first wrote about femmephobia, I really thought we’d moved on. 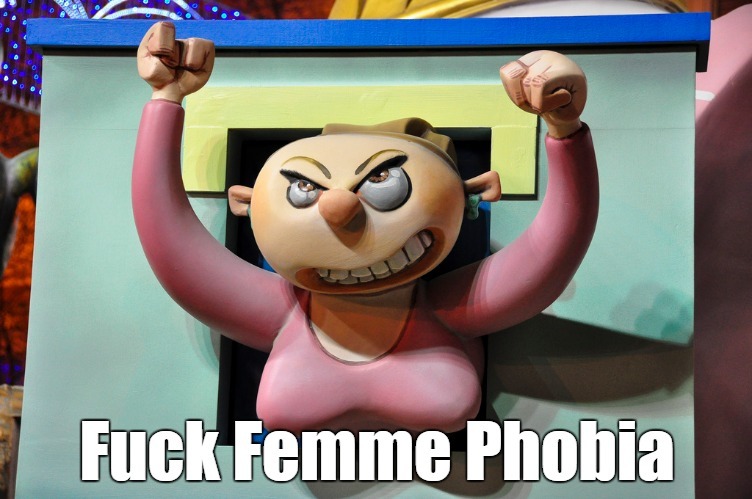 But seeing as we’re going back to basics, let’s start with defining femmephobia as the belief that there is something intrinsically un-natural or wrong with being or identifying as a femme lesbian. This is more than femme invisibility, although femmephobia itself is pretty much invisible to the world at large. No, femmephobia occurs when women identifying as femme lesbians are discriminated against as a result of this. This can occur outside of the LGBTQ community or within. It’s the internal femme phobia that is the most damaging, as it is replicating the sort of divisiveness that we have fought so hard to break down in the heterosexual world. Some people think overtly feminine lesbians are inauthentic - secretly straight women adopting lesbianism like a trend, or that they are closeted - hiding behind a presumed ‘straight’ exterior and playing up to this. Both hugely insulting to women who identify as lesbian and happen to also identify as femme. The main thrust of the current argument, however, isn’t about being femme per se, it’s that we shouldn’t put people in identity boxes at all. The protagonists of this line of thought believe that we are limiting ourselves by replicating heterosexual gender and sexual identity categories and norms. Putting people (or making people assign themselves) into boxes labelled ‘femme’ or ‘butch’ signifies adherence to prescribed ways of appearing or acting (i.e. if you are a femme you wear heels and like shopping). No tick box category is ever going to encompass the diversity of people under that umbrella and labelling can be the enemy of freedom. I agree. But I don’t think self-identifying as femme, butch, stone, soft butch, boi, or anything else is actually anti-equality, anymore than identifying with L, G, B, T or Q is. Broadly defining yourself in this way consolidates self-identity, and this can actually be empowering, rather than reducing – it all depends on what you interpret your chosen label to mean. To me, this is the crux of it: It’s the definitions and assumed definitions that are the problem, not the process of identifying with a label itself. It also depends on the context in which that identity label is applied and who is applying it. Personally, I like to identify as femme – not for political reasons, but for practical ones – specifically, online dating. Lesbian dating sites are notoriously needle in haystack, and as a femme who finds other feminine looking and acting women attractive, I find it very difficult to navigate hundreds of profiles without applying some kind of filter. Of course I could meet and totally fall for someone I never expected to – and I don’t have a check-list of what constitutes a femme. For me, it’s a broad category that means I look and dress fairly feminine but I am not sure that how I think is any more feminine than masculine, as I don’t really gender stereotype the brain! But everyone has a superficial idea of their ‘type’ and for me, that’s femmes. Within that, it’s about the person. Sites and events that cater for niche or minority groups are not discriminatory. Not unless they are purporting to be superior to any other group, or don’t respect difference. They can foster a sense of belonging and community. I personally think the increased visibility of femmes over the past few years has contributed much more to diversity and equality than it has detracted. I now see far more assumed 'femmes' on the scene, integrating with a vast array of other lesbians confidently, rather than one or two cowering at the corners of the room nervously. Self-identifying as femme has made me feel more confident in my own identity and has allowed me to challenge people's stereotypes of what a lesbian is (the answer obviously being that a lesbian is whatever each individual lesbian wants it to be). If someone else had opposed a label on me, that would be different. Coming out as a femme, attending femme events and using femme dating sites has also helped me to meet people and feel less isolated on the scene. I don't think I can be alone - the website R U Coming Out cited their most read article of last year my piece on coming out as a femme. The Equality Act has ‘protected characteristics’ of which sexual orientation is one. Equality between groups sometimes means defining what these groups are. And to define or label your own identity is a personal choice. It is a right and it should not be discriminated against any more than it should be prescribed. We're all individuals, and whilst we have a sexual orientation in common, the manifestation of this and the personality and experiences of individual lesbians may be poles apart. But lesbians and indeed all LGBTQ people do need to be a community, and to support each other in the face of our common battles. And now without meaning to reach 'the preachy part', I’m going to say that to me the essence of a community is that it is a diverse group of people, united due to having something in common - but not everything. Ultimately we want equality with the heterosexual world, and equality means every individual being respected for who they are, not being made to conform to any one idea of how people should look, be, or live. And I don't see how we can achieve this if we don't have equal respect for the diverse identities and people within our own community – those who choose to define themselves as one thing or the other, or not at all. [27/01/2016] TheLobster : Thanks to Nicci Talbot, journalist and Editor of Rude Magazine for her supportive comments on Facebook today regarding the recent femme phobic attack and her support of our campaign to battle femme ph... [ more ]obia. Read her comments here: "The issue of femmephobia has come up again this week with the founders of Pink Lobster Dating being criticised on social media for running a dating site for femme women. We have dating sites for various preferences to help us find what we're looking for so I can't see the problem with this one personally. Putting people into boxes isn't helpful - and gender appears to be more fluid than we thought - but there's nothing wrong with having a 'type', role model or preference as to what we like when it comes to sexual partners and our own personal style. For practicalities surely it's one way to narrow down the field and find a tribe you identify with? PL say they haven't excluded anyone for being 'too butch' and they haven't defined what's 'femme' either. The reaction and criticism seems over the top and unnecessary. This is a free society and there's room for different kinds of networking sites, so it's down to personal preference whether people choose to use them or not. We have limited time on this planet and spend most of it working so let people get on with it and meet who they want to meet however they want to do it!"